We're out enjoying our special bonding time with our beloved pets and getting our fresh air and exercise too. Being responsible dog owners, as we walk down the streets or sidewalks or romp at the park, we're prepared with our dog waste bags. So when do we use them? Of course, one obvious answer is "always". Every single time. Even if we are "off the path" or in the street or gutter, where no one else walks. It is true; we may have eliminated the possibility of another good soul stepping in our pet's feces. However, dog waste will still continue to do its damage. As it is washed down our streets and gutters, it continues on into our waters – our streams, rivers, lakes and onto our beaches. Studies done in the last few years have indicated that dog waste is third on the list of contributors of bacteria in our contaminated waters. Another study, using a variant of DNA fingerprinting, has proven that dog waste contributes 30% of the pollution in a stream. As one microbiologist commented, "that can be the difference between a beach closing and a beach not closing." If we walk through parks that are away from nearby waters, we must still be aware of the damage that dog poop can cause because of its high nitrogen content. In Boulder, Colorado, the native grasses in the mountain parks were being replaced by weeds because of dog poop. Boulder officials had to educate that "dog waste is not fertilizer", claimed Mike Patton, co-director of open space and mountain parks. "Some people really did believe it was." Using dog waste bags to scoop up dog waste will protect the grasses in our lawns, our community parks, and our dog parks. The other obvious answer to the question "when?" is "immediately." 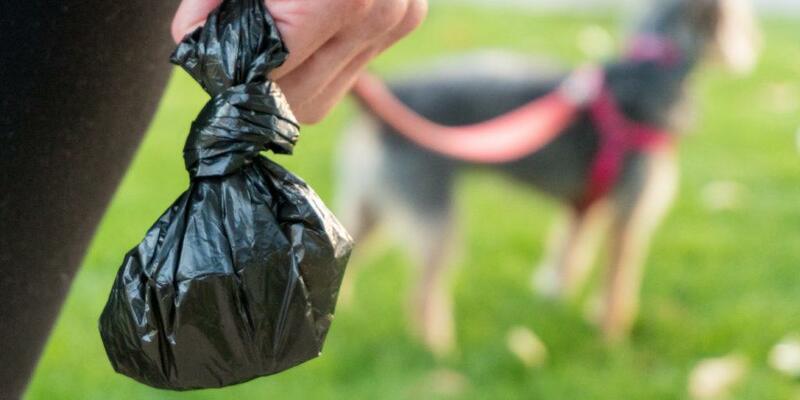 The longer the dog waste sits on the ground, the more potential it has to settle and make it more difficult to scoop up into our dog waste bags. In addition, it is more likely to be stepped in by others or even eaten by other dogs. Coprophagia is the scientific name for eating of feces and this is very common in the animal world for various reasons. However, dogs that eat the feces of other dogs can contract a variety of diseases, including worms and can then transmit those same parasites, worms, and diseases to humans. So picking up dog poop immediately and safely with dog waste bags is important, as well as immediately sanitizing our hands after doing so. Obviously, it is necessary to be prepared when we exercise our pets. We must carry our dog waste bags at all times in a unique waste bags carrier and then protect those full waste bags in this same discreet and convenient bag. If we use one new dog waste bags carrier that includes a pocket for hand sanitizer, then we will be completely prepared to always clean up dog waste and immediately sanitize our hands when we are finished. Delightful to welcome you all on my personal blog http://ayshasaeed.com/.I like to write blogs in free time. I chose http://ayshasaeed.com so that I can share the most accurate info with you guys & on the same I expect identical from you.